Barnabas Community got its start in the fall of 2008. Through our free store, we offer clothing, books, toys, household goods — and hope and hospitality — to all that walk through our doors. In addition to the free store, we now provide two meals per week, a monthly vision clinic, and a weekly worship service. It is through God’s grace and guidance that we have become an integral part of the Belmont Community and beyond. Our mission is to live out Christ’s compassion and love by sharing with all as a community. A site was selected on the north side of Cornhusker Highway at 11th Street in the Belmont Shopping Center. It was a single storefront which housed the free store and a small area for refreshments. The People's City Mission primarily provided donations of materials and snacks, while Sheridan provided most of the volunteers. It didn’t take long for word-of-mouth advertising to yield large number of guests who received compassionate care. In a few short years, The Barnabas Project outgrew its small storefront. Space was limited and the donations continued to flow. The need for a community center was also becoming evident. By the grace of God, our current location at 931 Saunders Avenue became available. 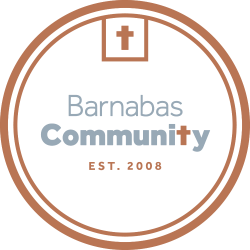 Very soon, it was determined that the name should be changed to "Barnabas Community" to show that this was not simply a project with an end in sight, but is a growing and thriving community of volunteers and guests coming together to help one another. All who come to Barnabas both give and receive, with the ultimate end of making grace, peace and mercy known. Since then, Barnabas Community has continued to increase in its offerings and services. In January 2018, we were granted 501(c)(3) status as an independent nonprofit organization. We have a governing board comprised of Sheridan Lutheran Church members. Sheridan Lutheran is our primary sponsoring organization and provides the bulk of our volunteers, financial backing and donations. Our community supporters and private donors provide volunteers and resources to keep Barnabas operational. We also provide a space where the community can gather and support one another, and this is also used each week as a Foodnet distribution site. While we have both volunteers and guests who come into Barnabas, those lines are blurring as we see everyone as a part of this incredibly diverse community.